It’s easy enough to say you want to get fit, but actually figuring out how to do it is a challenge. Personal trainers, physical therapists, exercise DVDs, and gym memberships can all help, but they can get expensive quickly. It’s entirely possible to come up with a custom, effective, at-home workout routine, with or without equipment. A warm-up gets the blood flowing and the muscles warmed up, which reduces the risk of injury or pain after a workout. This may consist of stretches, yoga, or similar activities, but recently dynamic, or moving, warm-ups have been shown to be particularly effective. You can do a dynamic warm-up by flowing from one stretch or yoga pose to another with no pause (but don’t rush and hurt yourself!). The Arthritis Foundation also has suggested dynamic warm-ups that are perfect for anyone with limited mobility or a pain condition. There are two major types of exercise: cardio and strength training. You can choose to do whatever type appeals most to you, ask your physician which kind would be most beneficial, or even do a quick online test to see what type of workout routine would fit you well. For example, Inner Titan has a quick quiz that will help you build a custom fitness plan. You’re given an explanation of the types of exercise you ought to do to reach your overall goal, such as why you should focus on stamina vs. strength. Additionally, you’re provided with a fairly detailed example routine and a little nutritional advice. If you have a medical or pain condition, approach the example routine and nutritional advice carefully. Don’t be afraid to find alternative, less-intense exercises elsewhere for your own routine, or to ignore the nutritional advice if you need to keep to a specific diet for your health. You can also use the F.I.T.T. Principle to help you build your workout routine. The letters in F.I.T.T. stand for frequency, intensity, time, and type. While the F.I.T.T. Principle does work for both cardio and strength workout routines, building each type of routine must be done a little differently. A cardio workout strengthens the cardiovascular system. It focuses more on getting your heart pumping and muscles loosened. The first part of the F.I.T.T. Principle—frequency—refers to how often you do your workout routine. Generally, a cardio workout should be done about five days per week, although it’s fine to start with just two or three and work your way up. The intensity of a cardio workout should be high enough to get your heart rate to its target heart rate zone. You can find this zone by putting your age and fitness level into a target heart rate calculator, like this one at About.com, or by discussing it with your physician. A heart rate monitor can help you track your heart rate during workout routines. If you don’t want to invest in a heart rate monitor just yet, check out the information about Exercise Intensity Levels from Weight Watchers. There’s a lot of information to figure out your heart rate, but there’s also a very easy way to figure out the intensity level of your workout routine. A light-intensity workout is fairly easy. You don’t sweat (unless it’s hot and humid). There’s no noticeable change in breathing pattern, so you’re able to both talk and sing. A moderate-intensity workout is somewhat hard. You start sweating after about ten minutes. Your breathing is deeper and slightly faster, so you’re able to talk but unable to sing. A high-intensity workout is difficult. You start sweating after three to five minutes. Your breathing is rapid, so you’re unable to sing and can only talk in short phrases. Generally, a mix of different intensities works well for a cardio workout routine. For beginners or those with medical conditions, though, the majority of the workout ought to be light-intensity. You can always increase the intensity gradually, but it’s better to start slow and avoid over-exertion. The next part of the F.I.T.T. Principle is time. This concerns how long your workout routine lasts. The rule of thumb is that the more intense your cardio workout routine is, the shorter it should be. Eventually, your workout routine should last at least 30 minutes, but it’s a good idea to build up to this. Also, time spent doing cardio workouts is cumulative. This means that instead of a 30 minute workout once a day, you can squeeze in three 10-minute workouts to get the same benefits. As for the type of exercise in your cardio workout routine, anything that increases your heart rate will work. This can include walking, swimming, biking, dancing, and more. The frequency of a strength training workout routine should be different than that of a cardio workout routine. For beginners, allow two days of rest between strength-training routines, although some experts suggest at least three days of rest between workouts when you’re starting out. Even after you’ve been doing your workout routine for a while, always allow at least one day of rest between workouts. With strength training, the intensity of your workout routine is determined by the type of exercise, the amount of weight lifted, and the number of repetitions and sets. Start with lighter weights. Consider going through the motions of your workout routine without any weight at all the first time and focus on your form first. If you don’t feel any pain over the next couple days, add a little weight and build up gradually, staying comfortable and focusing on form at all times. 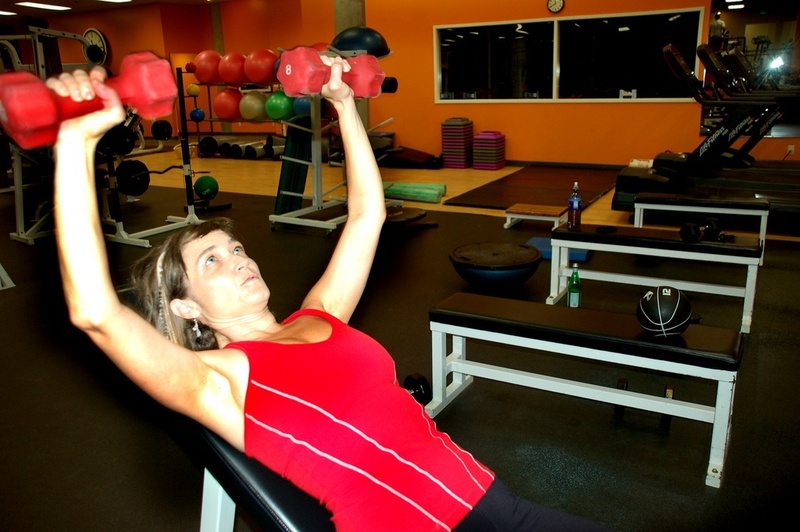 If you’re new to weight-training, it’s best to speak with a personal trainer to help you develop your own routine. Build up the number of repetitions and sets slowly. Stay at the same intensity for a week or two before increasing it, and then cut back to your previous intensity if you experience pain. If you notice that a particular exercise makes you sore, try something else. If possible, use machines instead of free weights. Also keep in mind that for a lot of strength training equipment, including machines and free weights, you can add foam grips to make it easier on your hands. As for the time you spend doing your strength-training workout routine, it should be long enough to challenge you but not long enough to exhaust you. The type of exercise you do can be anything that strengthens your muscles. Lifting weights or using weight machines work, but so do using resistance bands or even doing resistance exercises using your own bodyweight and little or no equipment. The most important thing to remember when creating your workout routine is that it’s your workout routine. Find exercises that work for you, and do them when and as much as feels right. Are there any other online resources that helped you build your workout routine?